Although free jazz is widely considered to begin in the late 1950s, there are compositions that precede this era that have notable connections to the free jazz aesthetic. Some of the works of Lennie Tristano in the late 1940s, particularly "Intuition", "Digression", and "Descent into the Maelstrom" exhibit the use of techniques associated with free jazz, such as atonal collective improvisation and lack of discrete chord changes. Other notable examples of proto-free jazz include City of Glass written in 1948 by Bob Graettinger for the Stan Kenton band and Jimmy Giuffre's 1953 "Fugue". It can be argued, however, that these works are more representative of third stream jazz with its references to contemporary classical music techniques such as serialism. Keith Johnson of AllMusic describes a "Modern Creative" genre, in which "musicians may incorporate free playing into structured modes—or play just about anything. "He includes John Zorn, Henry Kaiser, Eugene Chadbourne, Tim Berne, Bill Frisell, Steve Lacy, Cecil Taylor, Ornette Coleman, and Ray Anderson in this genre, which continues "the tradition of the '50s to '60s free-jazz mode". Ornette Coleman rejected pre-written chord changes, believing that freely improvised melodic lines should serve as the basis for harmonic progression. His first notable recordings for Contemporary included Tomorrow Is the Question! and Something Else in 1958. These albums do not follow typical 32-bar form and often employ abrupt changes in tempo and mood. One of the most key of Ayler's free jazz recordings is Spiritual Unity, including his often recorded and most famous composition, Ghosts, in which a simple spiritual-like melody is gradually shifted and distorted through Ayler's unique improvisatory interpretation. Ultimately, Ayler serves as an important example of many ways which free jazz could be interpreted, as he often strays into more tonal areas and melodies while exploring the timbral and textural possibilities within his melodies. In this way, his free jazz is built upon both a progressive attitude towards melody and timbre as well as a desire to examine and recontextualize the music of the past. Much of Sun Ra's music could be classified as free jazz, especially his work from the 1960s, although Sun Ra said repeatedly that his music was written and boasted that what he wrote sounded more free than what "the freedom boys" played. The Heliocentric Worlds of Sun Ra (1965) was steeped in what could be referred to as a new black mysticism. But Sun Ra's penchant for nonconformity aside, he was along with Coleman and Taylor an integral voice to the formation of new jazz styles during the 1960s. As evidenced by his compositions on the 1956 record Sounds of Joy, Sun Ra's early work employed a typical bop style. But he soon foreshadowed the free jazz movements with compositions like "A Call for All Demons" off of the 1955-57 record Angels and Demons at Play, which combines atonal improvisation with Latin-inspired mambo percussion. His period of fully realized free jazz experimentation began in 1965, with the release of The Heliocentric Worlds of Sun Ra and The Magic City. These records placed a musical emphasis on timbre and texture over meter and harmony, employing a wide variety of electronic instruments and innovative percussion instruments, including the electric celeste, Hammond B-3, bass marimba, harp, and timpani. As result, Sun Ra proved to be one of the first free jazz musicians to explore electronic instrumentation, as well as displaying an interest in timbral possibilities through his use of progressive and unconventional instrumentation in his compositions. Charles Mingus's albums The Clown and Tijuana Moods were free jazz. The title song of Pithecanthropus Erectus contained one improvised section in a style unrelated to the song's melody or chord structure. His contributions were primarily in his efforts to bring back collective improvisation in a music scene that had become dominated by solo improvisation as a result of big bands. By the 1970s, the setting for avant-garde jazz was shifting to New York City. Arrivals included Arthur Blythe, James Newton, and Mark Dresser, beginning the period of New York loft jazz. As the name may imply, musicians during this time would perform in private homes and other unconventional spaces. The status of free jazz became more complex, as many musicians sought to bring in different genres into their works. Free jazz no longer necessarily indicated the rejection of tonal melody, overarching harmonic structure, or metrical divide, as laid out by Coleman, Coltrane, and Taylor. Instead, the free jazz that developed in the 1960s became one of many influences, including pop music and world music. French artist Jean-Max Albert, as trumpet player of Henri Texier's first quintet, participated in the 60s in one of the very first expressions of free jazz in France. As a painter, he then experimented plastic transpositions of Ornette Coleman's approach. Free jazz, painted in 1973, used architectural structures in correspondence to the classical chords of standard harmonies confronted with an unrestrained all over painted improvisation.Jean-Max Albert still explores the free jazz lessons, collaborating with pianist François Tusques in experimental films : Birth of Free Jazz, Don Cherry… these topics considered through a pleasant and poetic way. A relatively active free jazz scene behind the iron curtain produced musicians like Janusz Muniak, Tomasz Stańko, Zbigniew Seifert, Vyacheslav Ganelin and Vladimir Tarasov. Japanese guitarist Masayuki Takayanagi and saxophonist Kaoru Abe, among others, took free jazz in another direction, approaching the energy levels of noise. Some international jazz musicians have come to North America and become immersed in free jazz, most notably Ivo Perelman from Brazil and Gato Barbieri of Argentina (this influence is more evident in Barbieri's early work). South African artists, including early Dollar Brand, Zim Ngqawana, Chris McGregor, Louis Moholo, and Dudu Pukwana experimented with a form of free jazz (and often big-band free jazz) that fused experimental improvisation with African rhythms and melodies. 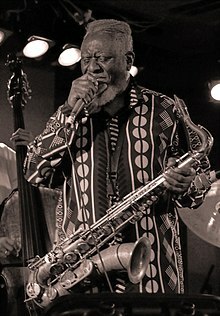 American musicians like Don Cherry, John Coltrane, Milford Graves, and Pharoah Sanders integrated elements of the music of Africa, India, and the Middle East for world-influenced free jazz. ^ "A Fireside Chat with Marc Ribot". All About Jazz. 21 February 2004. Retrieved 18 December 2018. ^ Robinson, J. Bradford (2002). Kernfeld, Barry (ed.). The New Grove Dictionary of Jazz. 1 (2nd ed.). New York: Grove's Dictionaries. p. 848–849. ISBN 1-56159-284-6. ^ a b Johnson, Keith. "Modern Creative Music Genre Overview". AllMusic. Retrieved 18 December 2018. ^ Allen, Jim. "Encyclopedia of Jazz Musicians". Taylor, Cecil. Jazz.com. Archived from the original on 2014-07-01. Retrieved 2014-04-22. ^ Kernfeld, Barry (2002). Kernfeld, Barry (ed.). The New Grove Dictionary of Jazz. 1 (2nd ed.). New York: Grove's Dictionaries. pp. 96–97. ISBN 1-56159-284-6. ^ Quersin, Benoit (1998). "La Passe Dangereuse (1963)". In Woideck, Carl (ed.). The John Coltrane companion : five decades of commentary. Schirmer Books. p. 123. ISBN 978-0028647906. ^ Kernfield, Barry. "Sun Ra". Grove Music Online. Oxford University Press. Retrieved 21 April 2014.